Hello friends! We live in a very hilly neighborhood, and we always thought that scooters or bikes would be dangerous for our son Phil. 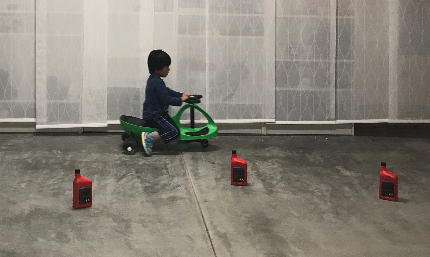 He'll be four soon, and we wanted to give him a cool set of wheels. We tried out a PlasmaCar at a local toy store, and really liked it! The store charged almost $80 USD for the same PlasmaCar that we found for under $50 USD on Amazon. We bought a green one on June 4th of this year, and Phil has been playing with it since then, so for over three months. What we like about the PlasmaCar is that it's a low wiggle car, so even if Phil crashes and falls (and he has), the impact is lower. The PlasmaCar is lightweight and easy to maintain. Just wipe it down with a wet towel, or hose it down. It also goes pretty fast, and your toddler can stop it at anytime with his feet. The learning curve is low. By day two, Phil learned how to steer the wheel, launch the car, and stop it. On leveled surfaces, your child could move the PlasmaCar by just steering it. She could work his upper body and lower body! Phil always have a nice nap after a run with his PlasmaCar! Of course, the PlasmaCar isn't perfect. What is? We've had to replace the wheels it came with because they were too loud outside. The original wheels are those thin plastic ones that tear apart at the surface rather quickly. We replaced the original wheels with polyurethane replacement wheels. Replacing the wheels helped make Phil's rides smoother, and even faster. We haven't had to replace these wheels yet, so they last over three months, at least. We recommend only supervised play for your toddlers on the PlasmaCar. I have to chase Phil around down the neighbor hills because he really flies down them. He's had a few crashes before, but has never gotten more than a few scratches or bruises. Even though this car is low, don't forget a helmet for your toddler. Here's a pretty cute helmet you could check out for your child. And because the PlasmaCar is low, watch out for cars in the neighborhood! What types of rides do your children like? Let us know! Cheers, my friends!